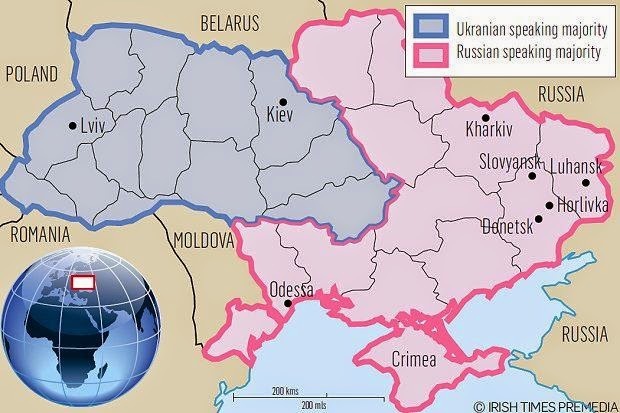 BRUSSELS, Belgium -- NATO Secretary General Anders Fogh Rasmussen said President Vladimir Putin’s assurances that Russia has no plans to intervene further in Ukraine can’t be believed, amid continued unrest in the run-up to the May 25 election. “After what we have seen in Ukraine, no one can trust the so-called guarantees given by Russia about sovereignty and integrity,” Rasmussen told reporters in Bucharest today at a briefing with Romanian President Traian Basescu. NATO says Putin, who annexed the Black Sea peninsula of Crimea in March, still has 40,000 troops on Ukraine’s border and hasn’t fulfilled a promise last week to pull them back. The U.S. and the U.K. vowed yesterday to punish Russia with industry-wide sanctions if the presidential election is undermined as the Kiev government’s forces moved to flush out separatists in the east. “If Russia or its proxies disrupt the elections,” the U.S. and its allies “will impose sectoral economic sanctions as a result,” Secretary of State John Kerry said in London yesterday after meeting his counterparts from Britain, Italy, France and Germany. Russia’s benchmark Micex Index of stocks was down 0.1 percent at 3:15 p.m. in Moscow. It’s dropped 4.5 percent since the start of Putin’s intervention in Crimea on March 1. The ruble lost 0.2 percent to 34.8319 versus the dollar. Ukraine’s hryvnia, which has lost 31 percent against the U.S. currency in 2014, declined 1.1 percent today, data compiled by Bloomberg show. Russia’s Foreign Ministry said on its website the report wasn’t objective and used double standards. In eastern Ukraine, government troops eliminated two rebel bases near the towns of Slovyansk and Kramatorsk, acting President Oleksandr Turchynov said yesterday. “The anti-terrorist operation can stop after weapons are surrendered and hostages released,” Turchynov said in parliament in Kiev. Russian calls to include rebels in national unity talks that began May 14 were rejected by the government, and the meetings opened without separatist leaders’ participation. Even as the U.S. and the European Union threaten more sanctions after the May 25 election, Russian Foreign Minister Sergei Lavrov has said it’s “ridiculous” to hold his country’s government responsible. Dozens of people have been killed and more than 100 kidnapped in eastern Ukraine since separatist unrest flared after Russia’s annexation of Crimea. The situation in the Donetsk region is worsening, with the sound of gunfire constant in Slovyansk and the surrounding district and public transport not functioning, the governor’s office said in a statement yesterday. Tensions have engulfed 15 towns and cities, according to the statement. Ukraine’s security service said today a group of rebels had been detained on the way to Slovyansk for organizing unrest in the southwestern port city of Odessa. The group acted on Russian orders, it said on its website. Ukrainian Social Policy Minister Lyudmyla Denisova said in parliament the government would no longer be able to provide welfare payments to residents in the Donetsk and Luhansk regions, where unofficial ballots last weekend backed a breakaway from Kiev, because of the security situation. Separatists in Luhansk and Donetsk have agreed to join forces to confront the central government. Rebels fighting for the self-proclaimed Donetsk People’s Republic said yesterday that they’ll “burn and wipe out” Ukrainian forces unless they withdraw from the region. “When Ukrainians kill Ukrainians, I believe it’s as close to civil war as you can get,” Lavrov told Bloomberg Television May 14. Even so, in the eastern port city of Mariupol, rebels and police agreed to end fighting under an agreement brokered by Metinvest Holding LLC, the company said on its website. Metinvest, controlled by Ukraine’s richest man, Rinat Akhmetov, runs iron and steel plants in Mariupol. The U.S. and the EU have already penalized 98 people and 20 companies over Russia’s actions in Ukraine. Should it interfere in the planned election, Russia will face punitive measures targeting entire industries, which may include energy, banking, defense and mining, according to a U.S. official who asked not to be identified following diplomatic protocol. The U.S. and its European allies agreed that industrywide sanctions would come next, the official said. The Russian speakers in Eastern Ukraine in its majority are Ukrainians. One of the main reasons they speak Russian are the policies of Ex-USSR. My family and I are good example of it. Thanks to my memories, I can recall that during late sixties and before Brezhnev. Ukrainian books for children wore briefly available in high verities. Personally I have spoke only Ukrainian until age of six but, with Brezhnev Ukrainian books for kids wore gun again. And as far as I remember all classes in all of the schools in my native Severodonetsk of Lugansk region was studied in Russian only. All lifestyle in ex-Soviet times was such, as to make Ukrainian language a none sense, as a result even thou I new Ukrainian, I had no one to speak with except my grand parents. Majority of families was so much international with Russian language dominating every where that of cause today's situation in Lugansk is understanding. With all that Russian propaganda that Eastern Ukraine was part of Russia and 400 years of attempts to root-out Ukrainian did its work. All the troubles in Eastern Ukraine caused by Russia years ago and today. Russia, leave the Ukraine alone!